Meet Reiter, a.k.a. 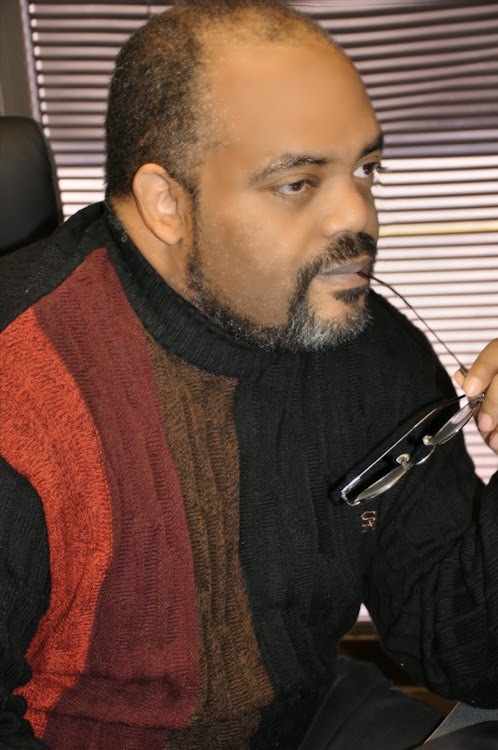 G. Russell Gaynor, the mastermind behind the Beyond the Outer Rim series, of which Star Chaser: The Traveler is the prelude. 1. Why did you write the book? What inspired you? One of the reasons I have the pen name Reiter is because that is the name of the persona that is Planner/Recorder of all things Th’iaM. Th’iaM is a very special place that was created when my friends and I felt that the rules of Dungeons & Dragons needed some adjustment. They added powerful aspects to the concept and I brought stories that I had composed as a child along with my brothers, Norris and Jerome. One thing led to another and before you know it, we had our own universe! Beyond the Outer Rim was the name of a scenario that we had running for a few years, real-time, and though we do not play it today, it isn’t hard to strike up a conversation of the adventures we all came to know and love. I am a storyteller . . . I decided I wanted to share the concepts behind those adventures. 2. What does the title mean? How did you come up with it? In the culture of the main character, Travelers are to that race what Rangers are to Middle Earth. They are mysterious people, often sliding in between commonly known definitions, but basically they are the Trackers of the Cosmos! Among the Travelers, there is an even more special niche, and that is where Dungias finds himself-- becoming a Star Chaser! While Travelers go about trekking the galaxies, Star Chasers commune with the Stars, becoming something of a questing tracker . . . a Ranger-Knight, if you will. As for how I came up with it, I was in the throes of telling the tale. It came to me and it’s been part of the BTOR story since its inception. 3. Tell us about the cover art. First of all, hats off to Thomas Wievegg for his mastery of the art! He put this cover together so quickly and smoothly; we never had any communication problems, and I have to say that I cannot wait to work with him again! The cover is basically a before-and-after picture of Z’Gunok Tel Dungias, the man who becomes the Star Chaser. Dungias is a Malgovi, a race of people who possess the natural ability to generate various forms of energy . . . at least, MOST of them can. Dungias is what they call shay-spawn, he is dark in a world where people can generate their own light. The story of Star Chaser: The Traveler is the story of how Dungias takes the cards he has been dealt and become a something of a gambler! I would love to say that I became a writer because I was first a reader, but that isn’t the case. I was a kid who loved his cartoons, and I was a child who believed that there was always a way to get something out of Grandma! When she was watching her boring black and white movies at a time when Mighty Mouse was on (oh yeah, so dating myself), some impish little kid resembling me piped up and said he could do better than these old and tired stories. Suddenly, the TV was off and I was walking with my grandmother to the local drug store where she purchased a stack of pads and a box of pencils. Next thing you know she sets me down in the living room and says, “Prove it!” So . . . I started writing . . . and writing . . . and writing. I put words to two and a half pads (not that big a deal, my handwritten letters were HUGE back then) and after reading them, my grandmother took me on another trip . . . to the local library. There I met Athos, Porthos, Aramis and d’Artagnan. Thank you Alexandre Dumas!!!! I found something better than cartoons and I’ve been in love with heroes ever since! 5. Who is your favorite character from the book? My favorite would have to be Freund. The German word for ‘friend’ is a peculiar character. As we tend to use what we know to identify what we do not know, I would say that he is Yoda and Gandalf, mixed in with your local bartender and a loquacious taxi driver. Some may get caught up in the power the character wields, but I am taken with the way he goes about his duties. He is the self-assigned protector of humanity in the Rims which is not an easy job. He does it in a way that inspires me. A very close second for me is Dungias but he can be so irritating at times! 6. Who is your least favorite? My least favorite character is Kiaplyx. An example of why we should be wary of Artificial Intelligence. His logic might be mathematically sound, but it leaves me feeling cold! 7. If you were to cast your book, what actors would you choose to play your characters? I believe I would take a page out of the Lucas playbook and cast fresh-faced talent; people who are more than hungry to be identified as capable thespians. I also believe that allows the audience to be more involved with the characters and the story instead of who is playing what role. 8. How important are names in your book? How do you choose names? Names are extremely important, but perhaps not in the way the mainstream might presume. Wyatt Earp and Annie Oakley became great names because of the people, not because people thought their names sounded cool. I have made it a point to divest myself of the cool-sounding name. What I want is the name to become cool because people come to love who and what that name defines. 9. What do you consider to be your biggest accomplishment? The four-part series of G. Russell Gaynor when he is better known as Daddy! I can never say enough of my children: Christopher, Joshua, Leonard and Valacia! Somewhere after that . . . yeah, being a story-teller is pretty cool too. 10. What are you favorite books/authors? You never get over your first, so Alexandre Dumas will ALWAYS be there (though The Three Musketeers is not my favorite of his!). William Faulkner made me look at life differently and I don’t think I’ve gone back. Alice Walker made me fall in love with the often overlooked beauties of life. Anne Frank taught me humility on a scale I still cannot measure. And Isaac Asimov taught me how to think in 360 degrees! 11. What books are you reading right now? 12. Do you have a work in progress that you’d like to tell us about? The most used file on my computer is the WIP File. If I could have the Devo song “Whip It” play every time I click on it-- that would be heavenly! A group of writers have come together, calling ourselves the Confederacy of the Quill, and we have penned a collection of short stories called The SylverMoon Chronicles. Currently, we are putting the polishing touches to Volume Four of that series. 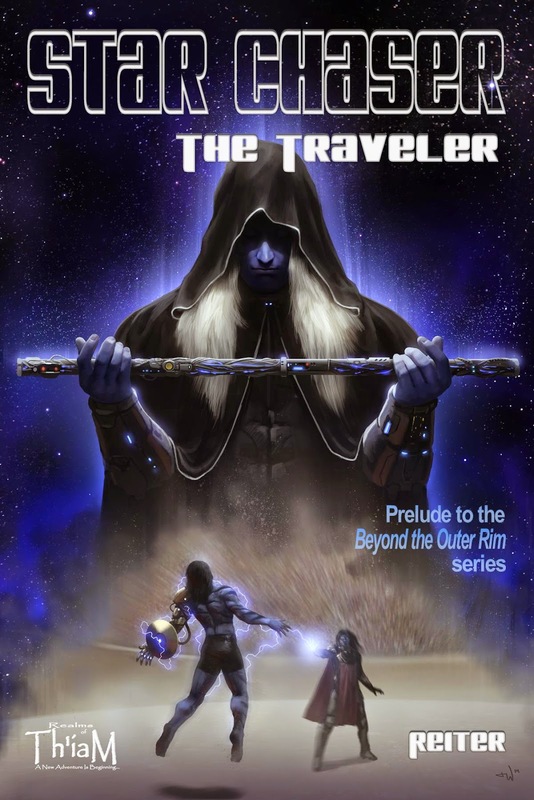 In this volume, there will be a short story that plays into the Beyond the Outer Rim storyline, falling in between the end of Star Chaser: The Traveler and the beginning of Starblazer: Through the Black Gate. Secondly, it was at Dragon*Con where I was asked to sit on a panel discussing dragons, alongside Todd McCaffrey and Naomi Novik, when I announced a project called “Vassals,” where non-magical dragons were the center point of the story. There is a teaser of that in SylverMoon Chronicles, and the novel is progressing along quite nicely. Lastly, Book One of the Beyond the Outer Rim series (Starblazer: Through the Black Gate) will be entering into its reader phase just before Christmas. Book Two is in the assembly phase. Born in a common house, in a common land, during a common time, Reiter was issued to the world in the same manner as any other notion of life. Born of circumstance and perspective, he came to see life from a standpoint most might label askew (but let’s not get him started on labels). It was through this angle of vision that his mind opened up to the limitless possibilities of thought and existence. Since our first act is to covet, Reiter’s train of thought was detoured to mythology and how such fantastic stories were used to explain scientific fact. That is where his abilities were first applied; the battle that rages between Atlas and Hercules continues to this day. The Moon moves closer to the Earth and then further away, depending on who is winning the contest. It is a simple beginning, perhaps, but a beginning nonetheless and one that ushered other stories that grew along with the young man, encompassing greater scope and depth. What some called ‘daydreaming,’ he called a work in progress. There is a universe out there, full of theory and definition – waiting for its story to be told. It holds comedy, tragedy, adventure, mystery, horror, action and intrigue. Reiter is but one of its storytellers! Russell was five when he found that people should be responsible for what they say when he had to write a story to back up his claim to his grandmother that he could do better in his sleep than the black and white movie he had watched. He handed two notebook pads to his grandmother who then agreed with his opinion. That was indeed the beginning! It will always be the opinion of those who receive art to measure its worth, but to date Russell has penned four novels, twenty screenplays, two plays, over two score poems and a role-playing game system. This, too, is only a beginning! Thanks for reading! As always, please feel free to leave questions/comments for the author below.